The 2001 Belgian Grand Prix (officially the LIX Foster's Belgian Grand Prix) was a Formula One motor race held at the Circuit de Spa-Francorchamps in Stavelot, Wallonia on 2 September 2001. It was the 14th round of the 2001 Formula One World Championship and the 48th edition of the event as part of the series. The 36-lap race was won by Ferrari driver and Drivers' Champion Michael Schumacher from a third position start. David Coulthard finished in second for McLaren with Benetton's Giancarlo Fisichella third. Although Juan Pablo Montoya of the Williams team won the pole position by recording the fastest lap in qualifying he stalled on the grid and forfeited the place. His teammate Ralf Schumacher lost the lead to Michael Schumacher into Les Combes turn. Michael Schumacher led the next four laps before the race was stopped for an major accident involving Jaguar's Eddie Irvine and Luciano Burti of Prost on lap five. The race was declared null and void and it recommenced with a revised distance of 36 laps. Michael Schumacher led every lap of the restarted race to take his fifth victory at the Circuit de Spa-Francorchamps. It was also his eighth win of the season and he bettered the four-time world champion Alain Prost's all-time record of career victories with his 52nd. Burti was kept in hospital with facial bruising and a concussion until 10 September; his accident helped enhance helmet safety. The result of the Grand Prix allowed Coulthard to further his Drivers' Championship advantage over the other Ferrari of Rubens Barrichello by four points in the battle for second. Barrichello in turn moved another two points clear of fourth-placed Ralf Schumacher. In the Constructors' Championship, McLaren in second moved further ahead of Williams in third by nine points as Jordan moved past British American Racing (BAR) for fifth with three races left in the season. The 2001 Belgian Grand Prix was the 14th of 17 scheduled single seater races of the 2001 Formula One World Championship and the 48th running of the event as part of the series. It took place at the 21-turn 6.968 km (4.330 mi) Circuit de Spa-Francorchamps in Stavelot, Wallonia on 2 September 2001. 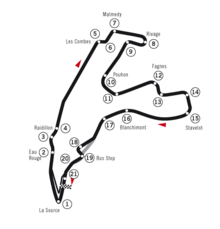 Although the track has been reduced from its original 14 km (8.7 mi) configuration due to safety requirements, it is still the longest of all the circuits raced on in Formula One. It contains a number of fast and long sweeping corners along with a high degree of gradient change, which puts a high amount of g-force on the driver. Before the race, both the Drivers' Championship and Constructors' Championship were already settled, with Ferrari driver Michael Schumacher having claimed the Drivers' Championship in the preceding Hungarian Grand Prix and Ferrari took the Constructors' Championship at the same event, with their nearest rivals McLaren too many points behind to be able to catch them. However, several positions in the standings were still undecided. In the battle for second place, David Coulthard of McLaren was five points in front of the second Ferrari of Rubens Barrichello in third and a further two ahead of Williams' Ralf Schumacher in fourth. In the Constructors' standings, McLaren in second were 13 points ahead of Williams, while Sauber and British American Racing (BAR) contended for fourth. Although he sustained a heavy crash during testing at the Mugello Circuit that left him with a sore neck, Michael Schumacher was passed fit by doctors to compete in Belgium. He stated that he would be unwilling to be concentrated in his driving, and did not say when he felt he would surpass four-time world champion Alain Prost's all-time record of 51 Grand Prix victories, which Schumacher equalled in Hungary. Coulthard said that he set himself the target of winning the remaining four races of the season to consolidate second in the Drivers' Championship and revealed he began preparing for the 2002 season. Barrichello stated that he had also targeted second and his teammate Michael Schumacher promised to help him, saying, "For me the season has just started." Several teams made modifications to their cars to suit the mid-downforce setup of the Circuit de Spa-Francorchamps. Williams debuted a lighter and stiffer chassis by 3 kg (6.6 lb) for driver Ralf Schumacher with a revised aerodynamic package through having better airflow to the FW23. Ferrari introduced a new front wing for the F2001 that was built upon a set of solutions test in the previous Grand Prix and adapted to suit the layout of the track. The Jordan team reverted to the aerodynamic configuration they used for its EJ11 chassis at the preceding Hungarian Grand Prix. Prost adopted a new rear suspension geometry with a deformable structure and a new semi-axle structure, characterised by a large extractor profile. Benetton, Arrows and Jaguar confirmed that technical innovations that the three constructors developed for use in Budapest would be utilised in Belgium, while Minardi manufactured a new chassis, the PS01B, which featured a revised rear crash structure and gearbox. Four practice sessions were scheduled before the Sunday race, two each on Friday and Saturday. The Friday morning and afternoon sessions lasted an hour; the third and fourth sessions, on Saturday morning, lasted 45 minutes. The Friday practice sessions were held in cool and overcast weather conditions that turned to a downpour in the afternoon, causing several drivers to aquaplane on the wet track. In the first practice session, Michael Schumcher was fastest with a lap of 1 minute and 48.655 seconds, followed by Jordan's Jarno Trulli, Barrichello, Mika Häkkinen of McLaren, Ralf Schumacher, Jean Alesi in the second Jordan, the Saubers of Kimi Räikkönen and Nick Heidfeld, Juan Pablo Montoya of Williams and Giancarlo Fisichella's Benetton. Coulthard lost control of his car by running wide onto sodden dirt, hitting a kerb at the exit of Les Fagnes corner, a right-hander taken at 160 km/h (99 mph) and collided with the inside metal barriers head-on, tearing the right-front wheel from his car's tethers. His heavily damaged car skidded backwards along the wall before stopping. Coulthard clambered out of the car unhurt though he missed the second practice session while it was repaired. Michael Schumacher concluded the first session like the first, recording the day's quickest lap in the second practice session at 1 minute and 48.655 seconds. Trulli did not improve his lap but duplicated his first session result in second and Barrichello remained in third. Fisichella was fourth-fastest, ahead of Häkkinen and his fellow compatriot Räikkönen. Ralf Schumacher, Jaguar driver Eddie Irvine, Alesi and Benetton's Jenson Button rounded out the top ten fastest drivers. During the period of rain, that came 16 minutes in and eased five minutes later, Button hit the armco metal barrier along the pit lane exiting the Bus Stop chicane. As Michael Schumacher was about to overtake Pedro de la Rosa's Jaguar going downhill to Eau Rouge corner, he could not see him due to spray reducing visibility and he ran into the rear of de la Rosa's car. His front wing was broken as de la Rosa's left-rear wheel was removed. Montoya lost control of his Williams FW23 on the wet kerb and he heavily damaged it after a spin into the tyre wall out of Les Combes corner. The third practice session was delayed for two hours due to fog, rain showers and low cloud reducing visibility until race organisers cancelled it for safety reasons because the emergency medical helicopters were grounded in Liège. When the sky cleared at 10:00 Central European Summer Time (UTC+02:00), it was agreed by the Grand Prix organisers that a single 45-minute session would be held but with practice starts barred to prevent a delay in television coverage for qualifying. Williams paced the session with Montoya fastest with a 1 minute and 47.974 seconds lap and Ralf Schumacher in second. The two McLarens were third and fourth, with Häkkinen ahead of Coulthard. Barrichello, Fisichella, Irvine, BAR driver Jacques Villeneuve, Button and Alesi completed the top ten ahead of qualifying. Several drivers ran off the slippery track surface during the session. De La Rosa, Irvine and Häkkinen went wide into the grass at the Bus Stop chicane, while Heinz-Harald Frentzen of the Prost team and Button ran off at Les Combes turn. Juan Pablo Montoya (pictured in 2002) earned the second pole position of his career after trading the fastest lap with his Williams teammate Ralf Schumacher in the final five minutes of qualifying. Saturday afternoon's qualifying session lasted for an hour. Each driver was limited to twelve laps, with the starting order decided by the drivers' fastest laps. During this session the 107% rule was in effect, requiring each driver to remain within 107% of the fastest lap time to qualify for the race. Heavy rain at the start promoted the field to remain in their garages until 26 minutes into qualifying when the first cars on intermediate tyres ventured onto the track. By then, sunny weather conditions enabled the track surface to progressively dry and cars were fitted with dry tyres in the last five minutes. Williams were the first team to switch their cars onto the dry tyres. This meant Montoya traded the fastest lap with his teammate Ralf Schumacher but he earned the second pole position of his career with a 1 minute and 52.072 seconds lap. Ralf Schumacher joined Montoya on the grid's front row with a lap that was 0.887 seconds slower. Michael Schumacher in third began in the spare Ferrari before switching to his race car when the track dried. Frentzen was hesitant to switch to the dry tyres but the Prost team owner Alain Prost convinced the driver to do so and he qualified fourth. Barrichello used the intermediate tyres throughout and he started fifth. Villeneuve ran conservatively for fear of making an driver error and he took sixth. Häkkinen qualified in seventh, bemoaning his conservative driving style due to the timing of the switch from intermediate to dry tyres. Eighth-placed Fisichella reported that the feel of his car was adequate in changeable circuit conditions. Coulthard fell from third to ninth in the closing seconds of qualifying due to his team telling him there was insufficient time to have the dry tyres fitted to his car and traffic delayed him. De La Rosa completed the top ten though he stopped with a loss of oil pressure. Panis was the fastest driver not to qualify in the top ten as his car was affected by an electrical fault that a change of steering wheel failed to rectify and his third timed lap was set too late to improve his position. Räikkönen occupied sixth in the final ten seconds though a reoccurring transmission fault put him 12th. Alesi chose not to switch to the dry tyres and he started 13th. Heidfeld in 14th suffered from the same transmission fault as his teammate Räikkönen and yellow flags were waved when he stopped at Burneville corner. An excessive amount of oversteer restricted Button to qualifying 15th. A lack of time to switch from the intermediate to dry tyres caught out Trulli and restricted him to 16th. Irvine in 17th switched to the spare Jaguar because the exhaust on his primary car broke and the spare had too much understeer. 18th-placed Luciano Burti of Prost was delayed for half a minute because of an tyre pressure adjustment error and it prevented him from improving his best lap. Jos Verstappen was 19th in the faster of the two Arrows though Irvine baulked him and a plan to do two timed laps did not come to fruition as he crossed the start/finish line three seconds after qualifying ended. Minardi's Fernando Alonso started in 20th due to him being on intermediate tyres at qualifying's end. The Arrows and Minardi formation continued on the eleventh row with Enrique Bernoldi 21st after he lost time because he was called to the weighbridge with five minutes left and he then ran out of fuel at the Bus Stop chicane. Tarso Marques completed the starting order in 22nd after Ralf Schumacher slowed him and his car's rear suspension buckled on his fourth timed lap. Although Verstappen, Alonso, Bernoldi and Marques failed to lap within the 107% limit, all four drivers were allowed to start the race because the stewards deemed that there had been "exceptional circumstances" owing to the changeable track conditions and also because they lapped within the limit during free practice. Afterwards, the McLaren team principal Ron Dennis lodged an official protest to the world governing body of motorsport, the Fédération Internationale de l'Automobile (FIA), to clarify if the regulation barring drivers on improving their lap times under yellow flag conditions was consistent after 17 competitors went faster with yellow flags to tend to Heidfeld's stricken car. At a meeting of the race stewards eight hours later, data, information and oral arguments were reviewed and Dennis' protest was rejected. McLaren did not appeal the decision. ^1 – Both the Arrows and Minardi drivers set a time outside the 107% limit, but were allowed to race due to heavy rain during qualifying. The drivers took to the track at 09:30 local time for a 30-minute warm-up session in cloudy and dry weather conditions. All drivers fine-tuned their race setups against the weather conditions of the time, and undertook laps in their spare cars. Michael Schumacher was fastest with a 1 minute and 49.495 seconds lap, followed by Häkkinen, Räikkönen, Ralf Schumacher, Irvine, Frentzen, Montoya, Trulli, Heidfeld and Barrichello. Trulli removed his car's front wing and bargeboards by running wide onto some bumps at Les Combes turn. He was rendered unable to steer and stopped on the trackside wall. Alonso lost control of his Minardi exiting Stavelot corner and destroyed its left-hand corner in a collision with the inside barrier alongside the circuit. He ricocheted across to the inside but clambered out of his car unhurt with aid from track marshals, as Marques stopped to check if his teammate was unhurt. Alonso was transported to the track's medical centre for a precautionary check-up and was passed fit to compete in the race though he used the spare Minardi. The race took place in the afternoon from 14:00 local time. Weather conditions at the start were overcast and some light rain fell on the track eleven minutes before the formation lap. The air temperature was between 12 to 16 °C (54 to 61 °F) and the track temperature was 17 °C (63 °F); weather forecasts on the day of the race predicted the possibility heavy rain in its latter stages. Before the formation lap was about to commence, Frentzen stalled because of a gearbox problem and Marques did the same. Both drivers were ordered to start from the back of the grid, causing the start to be aborted, and the number of laps reduced from 44 to 43. At the start of the second formation lap. Montoya in pole position was stationary as he engaged first gear. That meant Montoya forfeited pole position and he began from the rear of the grid. His teammate Ralf Schumacher led on the approach to Les Combes corner as he heavily locked his brakes. Barrichello kept third and Fisichella made a fast getaway to move into fourth. Going uphill into Les Combes corner, Michael Schumacher pulled out of Ralf Schumacher's slipstream and made a pass around the outside for first place. Villeneuve fell behind both of the McLarens at the same time. Luciano Burti (pictured in 2006) was involved in a 111g impact with the tyre barrier at Blancimont corrner on lap five. Button made the best start in the field, moving from 13th to ninth by the conclusion of the first lap, while Villeneuve fell four positions over the same distance. At the close of the first lap, Michael Schumacher led Ralf Schumacher by 2.1 seconds. Barrichello was a further six-tenths of a second behind Ralf Schumacher in third, while Fisichella in fourth was 2.2 seconds adrift of Barrichello. Over the next three laps, Michael Schumacher pulled away from the rest of the field, extending his advantage to 6.3 seconds. In the meantime, de la Rosa and Panis were overtaken by Alesi, who advanced to 16th as Montoya passed Versappen for 16th. There were further overtaking manoeuvres on lap three: Fisichella lost fourth to Häkkinen approaching Les Combes corner, and a driver error at the exit to RIvage turn caused him to lose fifth to the other McLaren of Coulthard on the outside into Pouhon corner. Further back, Räikkönen out-braked Villenueve at the Bus Stop chicane to move into seventh. Irvine was passed by Trulli for 14th. On the same lap, Alonso retired with a broken gearshaft. On the fourth lap, Alesi moved past Button for ninth, while Heidfeld and Trulli demoted Panis from 12th to 14th. Irvine lost another position when Montoya passed him for 15th. Irvine was then challenged by Burti on lap five. As Burti was about to overtake Irvine on the outside at Blancimont corner, Irvine was caught off guard and remained on the racing line, putting Burti's left-hand wheels onto the grass. Then Burti's right-front wheel and Irvine's Jaguar made contact. The collision removed Burti's front wing and prevented him from steering as it lacked front downforce. Irvine then went over the Prost's front wing and destroyed it. Burti was sent spearing across the gravel trap and into the four-deep tyre barrier at a speed of 150 mph (240 km/h). The front of Burti's full-face crash helmet broke as it took the full force of the impact, measured at 111 g0 (1,090 m/s2). However, further injury to Burti was prevented because he wore a HANS device, which absorbed the impact with the tyre barrier. Irvine went off the track with the right-hand wheels removed from his Jaguar. He then exited his car to assist the track marshals in removing the tyres pinned to Burti and released his car from the barrier. Räikkönen stopped with a transmission failure as Frentzen and Marques made pit stops. The safety car was deployed before the race was stopped. All the remaining drivers went on the starting grid to await the restart. Meanwhile, the FIA medical delegate Sid Watkins arrived to direct the extraction of Burti from his car. Burti was transported to the circuit's medical centre via ambulance with no emergency treatment. After a medical inspection, he was flown by helicopter to the Centre hospitalier universitaire de Liège in a conscious and stable condition but with a serious concussion. David Coulthard (pictured in 2009) finished in second to consolidate second in the Drivers' Championship. According to Article 158 of the 2001 Formula One Sporting Regulations, the first four laps were declared null and void, and the starting order was determined by the finishing order of the first four laps. This meant that the race re-commenced with a revised distance of 36 laps and a reduced field of 18 cars. The race restarted at 14:45 local time. Ralf Schumacher's Williams was not lowered from a jack at the start of the third formation lap because his mechanics were immersed on replacing his rear wing beam for safety reasons after Montoya's front wing broke. He avoided incurring a ten-second stop-and-go penalty though he was required to begin from the back of the grid. Fisichella made a fast start from sixth to pass the McLarens and Barrichello. He however could not pass Michael Schumacher for first into the La Source hairpin. Barrichello maintained third as Button moved to fourth. Coulthard was briefly in front of Häkkinen but his teammate moved ahead. Cresting a hill, both McLarens overtook Button as the BARs made contact and briefly drove off the circuit. On the lap, after being hit by Verstappen, Heideld attempted to pass de la Rosa on the inside at the La Source hairpin. The two made contact with Heidfeld retiring immediately with front wing and suspension damage as de la Rosa entered the pit lane the lap after with heavy car damage. Upfront, Michael Schumacher began to pull away from the rest of the field, increasing his lead over Fisichella to five seconds by the third lap. One lap prior, Montoya's car pulled to one side though he overtook four cars before his retirement from a engine failure. On lap three, Trulli overtook Button for sixth. Button lost another place to Alesi on the following lap. Michael Schumacher further extended his advantage to 14 seconds over Fisichella by lap six as Coulthard challenged the Benetton. Further back, Villeneuve passed Button for eighth. The first round of pit stops began at the conclusion of the lap when Trulli entered the pit lane. After his pit stop on lap seven, Panis crossed the white line to denote the pit lane exit, an infraction of the sporting regulations which entailed a ten-second stop-and-go penalty. Barrichello made his first stop on the ninth lap. Michael Schumacher held a 20-second lead over the rest of the field when he entered the pit lane for the first time on the next lap. He rejoined the race in second. Fisichella led before his own stop at the conclusion of the lap. He retained second place. Panis took his ten-second stop-and-go-penalty on the 12th lap. After the pit stops, the Grand Prix settled into a rhythm with Michael Schumacher further extending his advantage over Fisichella to 24.808 seconds by lap 15. At the rear of the field, Marques made an unscheduled visit to the pit lane for repairs to his suspension. Two laps later, Michael Schumacher lost concentration as he steered his Ferrari to the inside at Stavelot turn and ran wide after missing the apex of the corner. He rejoined the track without losing the lead. His teammate Barrichello hit a trackside bollard entering the Bus Stop chicane on lap 17. His car lost front downforce fro removing his front wing and he completed a full lap at reduced speed after missing the pit lane entry. Barrichello rejoined the Grand Prix in ninth. Michael Schumacher (pictured in 2001) took his eighth victory of the season and he broke the all-time wins record held by Alain Prost with the 52nd of his career. On lap 18, while under pressure from Ralf Schumacher, Button he struck a bollard on a kerb going into the Bus Stop Chicane. The contact removed his front wing and the lack of downforce sent him straight into the barrier beside the track. Trulli entered the pit lane on the following lap to begin the second round of pit stops. His teammate Alesi followed on lap 20. Fisichella was six-tenths of a second ahead of Coulthard in third by the time of his second stop on lap 23. Fisichella's car sprayed oil on Coulthard, causing the McLaren driver to clean his visor on the main straights. Coulthard made his stop the lap after, and emerged in third behind Fisichella. Michael Schumacher led by 43.6 seconds by the time of his second pit stop at the end of lap 25 and he retained the lead. On lap 26, Coulthard went to the inside to attempt an overtake Fisichella but he was unsuccessful. Häkkinen ran wide entering the Bus Stop chicane on lap 27 though he rejoined through the track by driving through the grass. On the next lap, Fisichella lost momentum while lapping Bernoldi, and Coulthard went to the inside for a pass but Fisichella defended at the La Source hairpin. Coulthard tried again by slipstreaming Fisichella going through Eau Rouge corner and he passed him around the outside for second. On lap 29, Ralf Schumacher overtook Villeneuve for eighth. Three laps later, Barrichello advanced to sixth by overtaking Alesi on the straight towards Les Combes corner. Jordan lost one of its EJ11s on the lap when the fifth-placed Trulli drove to the side of the track with oil smoke bellowing from the rear of his car. In the final three laps, Ralf Schumacher attempted to pass Alesi five times but he was unsuccessful each time. Upfront, Coulthard reduced Michael Schumacher's lead by a second per lap, as the German reduced his pace, but Schumacher took his fifth win at the Circuit de-Spa Francorchamps to equal the triple world champion Ayrton Senna's record number of wins at the track. It was also his eighth victory of 2001 and the 52nd of his career, breaking Alain Prost's all-time record of 51 wins. Coulthard followed 10.098 seconds later in second and Fisichella finished a season-high third. Häkkinen took fourth, Barrichello fifth and Alesi completed the point-scorers in sixth. The final finishers were Ralf Schumacher, Villenueve, Frentzen, Verstappen, Panis, Bernoldi and Marques. The top three drivers appeared on the podium to collect their trophies and spoke to the media in a later press conference. Michael Schumacher said he slowed to be conservative, "For whatever reason, I thought I had the chance to open up the gap for an extra pit and we didn't know whether they would do so I just wanted to have that safety margin because I was faster than Giancarlo and David couldn't get by I was able to open up such a lead." Nonetheless, he said that his 52nd win did not have his first priority, saying, "Actually I'm very delighted about this but I will be much more delighted sitting one day on the sofa, retired, and I have a cigar and beer in hand and think about it." Coulthard admitted his surprise over Fisichella's pace although he said he was pleased to finish second and increase his Drivers' Championship advantage over Barrichello, "Given the weekend I've had, I'm obviously very happy to have got second place, hoping that Luciano is 100 per cent and able to do the next race, and then we can all feel it's been a positive weekend." Fisichella attributed his third-place result to the new aerodynamic package on his Benetton that gave him improved grip and handling, "We did a very good job. I did two amazing starts, especially the second one from sixth position to second, and I'm happy. It's a great day, and I'd like to say thank you to the team." Giancarlo Fisichella (pictured in 2012) finished third for Benetton, his best result of the season. After the race, the stewards investigated the collision between Irvine and Burti on lap five by reviewing television footage and listening to Irvine's oral explanation. They took no further action and deemed it "a racing incident", with neither driver in particular to blame. It was the second major accident Burti had sustained in more than a month as he barrel rolled twice after colliding with the rear of Michael Schumacher's car at the start of the German Grand Prix in July 2001. The accident was a talking point for days after the race, with Alain Prost noting that Burti's impact would have been fatal about ten years earlier, and former driver Jacques Laffite praised the strength of the modern Formula One car's monocoque. The Jaguar team principal Niki Lauda told the press that he was unhappy with the inaction and conduct of the track marshals, "The marshals were not operating properly. Eddie had to take over and basically tell them what to do. He was really part of the rescue there, which normally drivers shouldn't do but he had to do it, since they didn't seem to have an idea what they need to do." Irvine said afterwards that he admitted to not foreseeing Burti attempting a pass to the outside of him but spoke of his relief that the Brazilian was conscious. Burti sustained facial and head bruising and he underwent a brain scan, which revealed a head injury though no swelling of the brain. Gary Hartstein, a member of the FIA's medical delegation, predicted that the driver would take up to two months to complete a full recovery. Burti underwent further tests and was placed in an induced coma until he left intensive care on 4 September. He was discharged from hospital six days later and returned to Monaco to continue his recuperation. Burti was replaced by the Czech International Formula 3000 driver Tomáš Enge for the rest of the season. He stated in subsequent interviews that he has no recollection of the crash itself. The effects of the accident caused Burti to suffer from seizures and amnesia for the next four months, both of which required medication. The FIA analysed the accident to enhance safety by outlawing the creation of holes in helmets that allowed drinking tubes and radio communication wires to pass through. In an interview with Autosport in 2019, Burti attributed his survival to safety improvements made after Ayrton Senna's fatal accident at the 1994 San Marino Grand Prix. Frank Williams, the team principal of the Williams team, stated that they made an error with Ralf Schumacher's car being left on a jack at the start of the third formation lap and that nobody could be blamed for it. Button said of his accident that caused him to retire from the race on lap 18, "I crashed out because I clipped one of the marker cones. The car was fine when I turned left, but it didn't want to turn right because the wing had fallen under my wheels, and so I hit the wall.'' The result of the Grand Prix left Coulthard nine points in front of Barrichello in the battle for second while the latter moved a further two points clear of Ralf Schumacher. In the Constructors' Championship, McLaren moved further away from Williams by another nine points, while Jordan moved past BAR for fifth with three races left in the season. ^ a b "2001 Belgian GP: LIX Foster's Grand Prix de Belgique". Chicane F1. Retrieved 20 April 2019. ^ "History of the Belgian Grand Prix". Formula1.com. 28 August 2001. Archived from the original on 30 August 2001. Retrieved 20 April 2019. ^ "Spa-Francorchamps, the best race of the year". F1Racing.net. 29 August 2001. Archived from the original on 30 September 2004. Retrieved 20 April 2019. ^ a b Matchett, Steve (29 August 2001). "Steve Matchett's Belgian GP Preview". Speedvision. Archived from the original on 28 November 2001. Retrieved 20 April 2019. ^ a b c d e f g "Formula One Points Tables – 2001". Crash. Archived from the original on 21 July 2015. Retrieved 22 May 2015. ^ "Plus: Auto Racing; Schumacher to Race After Practice Crash". The New York Times. Associated Press. 28 August 2001. Retrieved 20 April 2019. ^ "Schumacher: The Pressure is Still High". Atlas F1. 28 August 2001. Retrieved 19 November 2015. ^ "Coulthard's four-star aim". BBC Sport. 31 August 2001. Archived from the original on 17 October 2002. Retrieved 20 April 2019. ^ Piola, Giorgio (4 September 2001). "Williams, meglio light". Autosprint (in Italian) (36). p. 32 – 34. ^ a b c "2001 Formula One Sporting Regulations" (PDF). Fédération Internationale de l'Automobile. 4 October 2000. Archived from the original (PDF) on 4 June 2001. Retrieved 8 July 2014. ^ a b c d "Free Practice". Fédération Internationale de l'Automobile. 31 August 2001. Archived from the original on 19 November 2001. Retrieved 20 April 2019. ^ a b "Friday First Free Practice – Belgian GP". Atlas F1. 31 August 2001. Archived from the original on 1 November 2001. Retrieved 20 April 2019. ^ a b "Schumi coasts as Coulthard crashes at Spa". F1Racing.net. 31 August 2001. Archived from the original on 30 September 2004. Retrieved 20 April 2019. ^ a b c "Free practice 2: Schuey shunts". Autosport. 31 August 2001. Retrieved 20 April 2019. ^ a b c "Schumacher still quickest in wet second session". F1 Today. 31 August 2001. Archived from the original on 6 January 2002. Retrieved 20 April 2019. ^ a b "Saturday First Free Practice Cancelled Due to Fog". Atlas F1. 1 September 2001. Archived from the original on 11 November 2001. Retrieved 20 April 2019. ^ "Free practice 3: A Williams one-two". Autosport. 1 September 2001. Retrieved 20 April 2019. ^ a b "Saturday Second Free Practice – Belgian GP". Atlas F1. 1 September 2001. Archived from the original on 11 November 2001. Retrieved 20 April 2019. ^ a b c d e "Free Practice and Qualifying". Fédération Internationale de l'Automobile. 3 February 2002. Archived from the original on 3 February 2002. Retrieved 20 April 2019. ^ a b c Gardner, John (1 September 2001). "Belgian GP: Montoya Takes Pole". Speedvision. Archived from the original on 3 September 2001. Retrieved 20 April 2019. ^ "Qualifying: Juan's slick performance". Autosport. 1 September 2001. Retrieved 20 April 2019. ^ a b c d e "Saturday's Selected Quotes – Belgian GP". Atlas F1. 1 September 2001. Archived from the original on 11 November 2001. Retrieved 20 April 2019. ^ "DC furious after qualifying debacle". ITV-F1. September 2001. Archived from the original on 8 September 2001. Retrieved 20 April 2019. ^ a b "Belgium 2001 – Qualifications • STATS F1". www.statsf1.com. Retrieved 14 November 2018. ^ a b Mansell, Nigel, ed. (2001). 2001 Formula One Annual. European Press Ltd. pp. 353, 379, 495. ISBN 0-9541368-0-2. ^ "Arrows and Minardi Cleared to Race at Spa". Atlas F1. 1 September 2001. Archived from the original on 11 November 2001. Retrieved 20 April 2019. ^ "McLaren protest rejected". Autosport. 1 September 2001. Retrieved 20 April 2019. ^ a b c "Grand Prix of Belgium". Gale Force F1. 2 September 2001. Archived from the original on 8 August 2007. Retrieved 19 November 2015. ^ a b "Warm-Up". Fédération Internationale de l'Automobile. 2 September 2001. Archived from the original on 19 November 2001. Retrieved 20 April 2019. ^ a b c d "Sunday Warm-Up – Belgian GP". Atlas F1. 2 September 2001. Archived from the original on 11 November 2001. Retrieved 20 April 2019. ^ "Alonso walks away from heavy collision in warm-up". Formula1.com. 2 September 2001. Archived from the original on 24 October 2001. Retrieved 20 April 2019. ^ a b c d e f g "2001: Spa (Race Commentary)". F1-Live.com. 2 September 2001. Archived from the original on 10 November 2001. Retrieved 19 April 2019. ^ a b c d e f g h i j "Lap-by-lap report from Spa". ITV-F1. 2 September 2001. Archived from the original on 9 September 2001. Retrieved 20 April 2019. ^ "No rain for now expected in Spa". F1Racing.net. 2 September 2001. Archived from the original on 30 September 2004. Retrieved 21 April 2019. ^ a b c d e "Sunday's Selected Quotes – Belgian GP". Atlas F1. 2 September 2001. Archived from the original on 1 November 2001. Retrieved 19 April 2019. ^ a b c d e f g h i j k l m n o p q "Schuey wins Belgian GP; 52 wins set new record". Autoweek. 2 September 2001. Retrieved 21 April 2019. ^ a b c d e f g h i j "2001 − Round 14 − Belgium: Spa". Formula1.com. 2 September 2001. Archived from the original on 4 December 2001. Retrieved 19 November 2015. ^ a b c "Michael Schumacher wins Belgian Grand Prix". F1Racing.net. 2 September 2001. Archived from the original on 29 September 2004. Retrieved 19 April 2019. ^ a b c d e f g h i j k "Grand Prix Results: Belgian GP, 2001". GrandPrix.com. Retrieved 19 November 2015. ^ a b "Lap-by-Lap: Grand Prix of Belgium 2001". Gale Force F1. 2 September 2001. Archived from the original on 26 January 2004. Retrieved 19 November 2015. ^ "12. Belgium 2001". www.statsf1.com (in French). Retrieved 23 April 2019. ^ a b "Lapwatch: Belgian GP". BBC Sport. 2 September 2001. Archived from the original on 2 October 2002. Retrieved 19 April 2019. ^ a b c d e Siqueira, Felipe (16 July 2014). "Após 13 anos, Burti recebe capacete de terrível batida em Spa: "Troféu"" (in Portuguese). Rede Globo. Archived from the original on 19 July 2014. Retrieved 19 April 2019. ^ a b Gardner, John (2 September 2001). "Belgian GP: Schuey Rewrites History with Spa Win". Speedvision. Archived from the original on 5 September 2001. Retrieved 21 April 2019. ^ a b Straw, Edd (4 February 2019). "Burti: Senna safety improvements saved me in 2001 Belgian GP crash". Autosport. Retrieved 21 April 2019. ^ Legard, Jonathan (3 September 2001). "Burti smash overshadows Schu win". BBC Sport. Archived from the original on 2 October 2002. Retrieved 21 April 2019. ^ a b c Casert, Raf (2 September 2001). "Brazil's Burti crashes at Belgian GP". Canadian Broadcasting Corporation. Retrieved 21 April 2019. ^ a b c "Belgian Grand Prix: Schumacher cruises to record victory". The Sunday Telegraph. 2 September 2001. Retrieved 21 April 2019. ^ a b c Wilkins, Robert (2 September 2001). "Belgium GP 2001 – Schu takes a record 52nd win..." Crash. Retrieved 21 April 2019. ^ a b Baldwin, Alan (5 September 2001). "Williams Accepts Mistake, Defends Team Manager". Atlas F1. Reuters. Archived from the original on 11 November 2001. Retrieved 21 April 2019. ^ "Race: Michael makes win record his own". Autosport. 2 September 2001. Retrieved 21 April 2019. ^ Spurgeon, Brad (3 September 2001). "Belgian Prix Victory Propels Him Past Prost : Schumacher Collects His Grandest Trophy". International Herald Tribune. Retrieved 21 April 2019. ^ a b c d "Post-Race Press Conference – Belgian GP". Atlas F1. 2 September 2001. Archived from the original on 11 November 2001. Retrieved 21 April 2019. ^ "Burti wants to 'thump' Irvine". Car magazine. 2 September 2001. Retrieved 21 April 2019. ^ a b Baldwin, Alan (2 September 2001). "Burti Recovering after Nightmare Crash". Atlas F1. Archived from the original on 11 November 2001. Retrieved 21 April 2019. ^ "Lauda Criticises Marshals over Burti Rescue". Atlas F1. 2 September 2001. Archived from the original on 8 February 2002. Retrieved 21 April 2019. ^ "Burti faces long lay-off". BBC Sport. 6 September 2001. Archived from the original on 21 April 2019. Retrieved 21 April 2019. ^ "Burti better, but doesn't remember crash". Independent Online. 5 September 2001. Retrieved 21 April 2019. ^ "Burti returns home". Crash. 10 September 2001. Retrieved 21 April 2019. ^ "Enge quits Prost to return to F3000". motorsport.com. 16 January 2002. Retrieved 21 April 2019. ^ a b "Burti recalls Spa crash that ended F1 career". Motor1.com. 1 September 2012. Retrieved 21 April 2019. ^ Allsop, Derick (4 September 2001). "Motor racing: Schumacher relentless in pursuit of further records". The Independent. p. 17. Retrieved 21 April 2019 – via General OneFile. ^ "2001 Belgian Grand Prix". Formula One. Archived from the original on 28 October 2014. Retrieved 26 December 2015. ^ "2001 Belgian Grand Prix Race Classification" (PDF). Fédération Internationale de l'Automobile. 2 September 2001. Archived from the original (PDF) on 2 March 2005. ^ a b "Belgium 2001 – Championship • STATS F1". www.statsf1.com. Retrieved 13 March 2019. This page was last edited on 23 April 2019, at 05:41 (UTC).